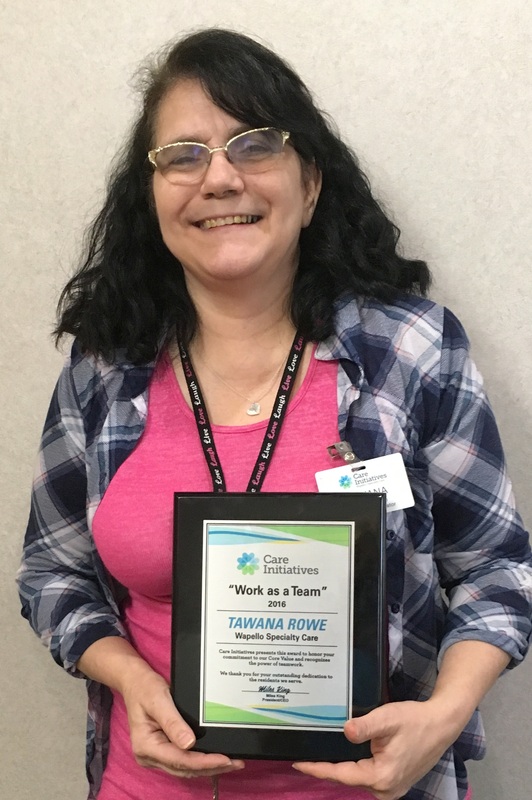 Wapello Specialty Care Activity Coordinator Tawana Rowe was awarded Care Initiatives’ “Work as a Team” award at the Care Initiatives annual award brunch Friday, Dec. 16 in West Des Moines. “She also works on behalf of the residents and their families to find activities that engage everyone here,” Paris said. The “Work as a Team” award is one of six “Core Value” awards given to a nominated employee throughout our statewide organization of 3,000+ employees. Wapello Specialty Care is one of 50 locations owned and operated by West Des Moines-based Care Initiatives providing skilled nursing, rehabilitation, Alzheimer’s/dementia, assisted living and hospice care throughout Iowa. For more information about Care Initiatives or Wapello Specialty Care, visit careinitiatives.org or call 319.523.2001.